Black pearls are not, as many people think, dyed to that shade, but are naturally occurring pearls from the black lip oyster. 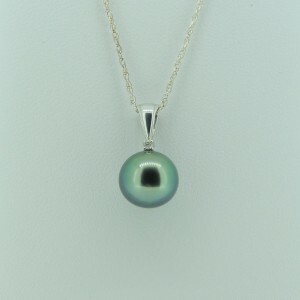 They are sometimes also called Tahitian pearls. Cultured black pearls are made like any other, by introducing a bead into the oyster shell when the mollusc is about two years old. This high quality and virtually blemish-free Tahitian pearl is set in a pendant of 18ct white gold, along with diamonds to offset its lustrous beauty. 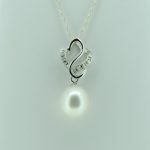 The chain is not included in this offer and if you would like a different pearl, please contact us for details.